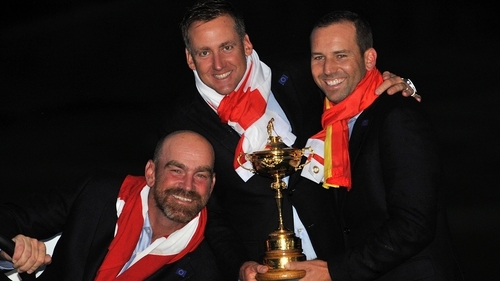 European captain Thomas Bjorn has named Paul Casey, Sergio Garcia. Ian Poulter and Henrik Stenson as his four wildcard picks for this month's Ryder Cup in Paris. They join Rory McIlroy, Open winner Francesco Molinari, Spaniard Jon Rahm, Sweden's Alex Noren, Dane Thorbjorn Olesen and English trio Justin Rose, Tyrrell Hatton and Tommy Fleetwood, who all qualified automatically. Irish pair Paul Dunne (17th on the European points list) and Shane Lowry (19th) miss out but Graeme McDowell and Padraig Harrington will be Bjorn's vice-captains, alongside Lee Westwood and Luke Donald. With five rookies in the eight automatic choices, Bjorn has stacked his captain's picks with experience. Garcia's selection is perhaps the most contentious as his form has been poor this year, missing the cut at all four majors, but the Dane insists his contribution in the locker room will be just as important as on the golf course. He said: "You've got to look at Sergio in certain ways. He is the heartbeat of the team, it's like a football team going without a captain. "Not only is he a fantastic golfer, but he also makes everyone around him better. "He is what is great about the European team room, he is everything that European Ryder Cup is about. "I watched him as a player and I watched him as a vice-captain and there is just something about him." Poulter's selection is no surprise owing to his brilliant record in the competition, winning 12 of his 18 Ryder Cup matches while he also won on the PGA Tour earlier this year. Russell Knox, Eddie Pepperell, Matthew Fitzpatrick and Rafa Cabrera-Bello were all ranked higher than Garcia but miss out. Europe are attempting to win back the trophy after being well-beaten at Hazeltine National in Minnesota in 2016, their first loss in the biennial match since 2008. Late on Tuesday, USA captain Jim Furyk named Bryson DeChambeau, Phil Mickelson and Tiger Woods as his first three wild cards for the biennial contest, which takes place from 28-30 September at Le Golf National in the suburbs of the French capital. Furyk will name his final pick on Monday, following this weekend's penultimate PGA Tour event, the BMW Championship. Tony Finau, Xander Schauffele and Kevin Kisner are all in contention to join the aforementioned trio and automatic qualifiers Brooks Koepka, Patrick Reed, Rickie Fowler, world no 1 Dustin Johnson, Jordan Spieth, Webb Simpson, Justin Thomas and Bubba Watson.